The Congress today put up an impressive show of strength during its march from Nagrota Bagwan to the rally venue near the HP Assembly complex here. Chief Minister Prem Kumar Dhumal will write to the Prime Minister for bringing cement under the Essential Commodities Act. He gave an assurance to this effect to the Assembly today after the issue of high cement prices in the state was raised by members. The issue of illegal mining in the state assumed prominence during question hour in the winter session of the Himachal Assembly today. With a significant increase in the number of vultures in the state from merely 40 to about 600 in the past five years, the state Wildlife Department has sought the creation of conservation reserves which will further enhance the chances of their breeding and conservation. The state government’s much-hyped free deliveries in government hospital under the Matri Seva Yojna (MSY) came under a cloud today when a pregnant hearing impaired woman, Raksha Devi, was refused delivery in zonal hospital as the only gynaecologist was out of station for attending family planning camps in the district. An electricity bill scam has been unearthed in the office of the Baddi SDO where money deposited in lieu of monthly bills was allegedly embezzled by two clerks of the department while customers were issued payment receipts. The rock cut monolithic temples of Kangra relived their past glory, when the state Department of Tourism organised a concert of classical music at the backdrop of the Masrur temples to promote them as a heritage tourism site last evening. Thousands of Congress workers gathered at Nagrota Bagwan this morning under the stewardship of the local MLA, GS Bali, who was the convener of the rally. The party workers went on foot and in vehicles for about 20 km from Nagrota Bagwan to the venue. 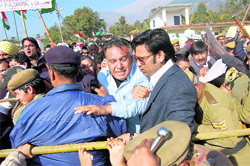 The march led to a traffic jam on the Dharamsala-Palampur road for several hours. Many Congress workers came from different areas of the state and joined the march en route. The AICC general secretary and party in charge for Himachal, Birender Singh, CLP leader Vidya Stokes and Aneez Ahmed, AICC secretary, also joined the party workers. The Congress march reached Zorawar Singh Stadium, near the Assembly complex, at about 1.30 pm. The growing strength of Congress workers gave an anxious time to police officials. The officials tried to block the way to the Vidhan Sabha using a JCB machine that was parked on the road leading to the rally venue. However, Bali warned the officials to remove the JCB . As the Congress workers at the rally venue got up from their seats, the JCB was immediately removed. While addressing the rally Birender Singh alleged that the BJP had a tendency to tell lies. He targeted Anna Hazare and his associates by alleging that they should also come clean on the corruption charges against them. The Congress had put even a Union Minister and MPs behind bars in cases of corruption and the BJP should come clean on the graft charges against its leaders, he said. Birender Singh said in the next two months the Congress would organise a march from Hamirpur. Stokes said the rally had proved that the BJP’s popularity was declining. Bali alleged that a large number of Congress workers coming to attend the rally had been stopped on the way by the district administration. He said the Congress would keep tabs on tomorrow’s BJP rally to see that government machinery was not misused. Earlier during the rally the message of HPCC president Kaul Singh was read out to the party workers by Kuldeep Rathore. In his message Kaul Singh said he would tour the entire state to expose the present government. Asha Kumari, AICC secretary, read out the political resolution adopted during the rally. In the resolution the Congress alleged that many industrialists and other rich persons had bought land through benami deals in the state. It said that even BJP leaders had to form the morcha for highlighting corruption cases against the present government. The resolution also condemned the use of alcohol and money power during the Renuka byelection. Birender Singh cut short certain supporters of Virbhadra Singh, Union Minister for Micro, Small and Medium Enterprises, when they tried to raise slogans in the latter’s favour during the rally. Virbhadra Singh’s supporters started raising slogans in his favour while Birender Singh was delivering his speech.He, however, cut them short by stating that they should raise slogans in favour of Sonia Gandhi or HPCC president Kaul Singh. By successfully organising a Congress show of strength in Kangra, Bali has emerged as an influential leader from the lower regions of the state. Mukesh Agnihotri and OP Rattan,Congress spokespersons, HPCC general secretary Chander Kumar, Ram Lal Thakur and all party MLAs were present at the rally. Responding to a query from Congress MLA from Santokhgarh Mukesh Agnihotri, the Minister for Food and Civil Supplies informed the House that Ambuja company was selling bags of cement at prices ranging from Rs 309 to Rs 350, ACC, Rs 305 to Rs 345 and JP, Rs 295 to Rs 326 in the state. He claimed the Government of India had excluded cement from the list of items under the Essential Commodities Act in 2002. So, the government had no control over the prices of cement. The minister said cement prices were higher in the state due high transportation costs and the government had no power to tell cement companies to reduce the prices. The minister said a 50 kg bag of cement cost about Rs 150 to cement companies. The companies were supplying cement at a rate of Rs 158 per bag to the government for public works. After adding all taxes, a bag of cement could not cost more than Rs 250 to the companies. By selling cement at prices up to Rs 345, the companies were making an unreasonable profit. To the reply of the minister,Congress MLAs led by Mukesh Agnihotri said that while on the one hand the government was claiming that it was holding talks with the cement companies on the matter, on the other it was claiming that it had no power to get the prices reduced. The Chief Minister said in his reply that the government was making efforts in this regard by holding talks with the cement companies. The Government of India had also held talks with steel and cement companies when the prices of the said commodities had risen abnormally. However, since the product had been removed from the list of items under the Essential Commodities Act, the government had no control on it. He, however, assured the House that he would write to the Prime Minister on the issue. To a question from Independent MLA from Nurpur Rakesh Pathania, Minister for Industries Kishan Kapoor informed the House that since April 2008, the Mining Department had registered 8,389 cases of illegal mining in the state and collected a fine of Rs 2,02,74,322 from the offenders. From the information provided by the minister, it became evident that about 10 cases of illegal mining were being registered in the state per day in the past three years. Pathania, however, alleged that stone crusher owners were violating the lease norms. He alleged that short-term permits were being issued to stone crusher owners under which they were violating these norms. He claimed that the state was losing revenue of about Rs 25 crore due to illegal mining. He also claimed that illegal mining was continuing in Khaniara village, near Dharamsala, and the department was not taking any step to check it. Pathania alleged 90 per cent of the stone crushers in the Nurpur area were functioning illegally. On the allegations made by Pathania, the Minister for Industries said he should provide the relevant information to the government so that action could be taken against the culprits. Chief Minister Prem Kumar Dhumal, while speaking on the issue, said the members should not file complaints in the House. They should instead be given to the government so that appropriate action could be taken. In response to a question from Congress MLA from Baijnath Sudhir Sharma, the Chief Minister informed the House that the length of the landing strip of Gaggal airport in Kangra had been increased from 3,900 ft to 4,500 ft so that ATR-42 type planes could land on it. He said the government had been consistently requesting the public sector oil companies to provide refuelling facilities at Gaggal airport so that fares could be reduced. However, till date no success had been achieved in this regard. He also said that despite an assurance from Union Minister for Civil Aviation Praful Patel the night-landing facility had not been provided at any airport in the state. The BJP MLA from Rajgir, Atma Ram, raised the issue of the centralised purchase of signboards worth Rs 9.30 lakh by the BDO, Panchrukhi, and alleged anomalies in it. The Minister for Rural Development and Panchayati Raj assured the House that the matter would be looked into. While responding to a query from Rajesh Dhirmani, Congress MLA from Ghumarwin, the Chief Minister told the House that the government was considering a proposal to bring the police under the Right to Service Act. The Wildlife wing has already placed the matter before the state Wildlife Board so that provision for the creation of exclusive vulture conservation reserves can be made under the Wildlife Protection Act. Although the department has already created 28 special nesting sites in Kangra for the fast-dwindling birds, having conservation reserves will help increase their population. “We are keen that a few vulture conservation reserves should be created by covering more than one nesting site, 28 of which have been set up in Kangra,” said AK Gulati, Chief Wildlife Warden. He said the results of the initiatives taken by the department had yielded encouraging results with an appreciable increase in the number of vultures. The special nesting sites spread over 10 hectares have been created by the department to provide a protected habitat and proper feed away from human interference for the vultures, resulting in very good conservation results. “We provide skinned carcass in the area so that the vultures get their favourite food which is safe for their consumption,” said Gulati. Cobblers were given Rs 500 per carcass and later they were allowed to collect the bones to sell these. The wildlife staff had spotted eggs in 158 of the over 200 nests and as such it is expected that the number of birds will go up considerably. In March-April next year the department intends to undertake another campaign to ascertain how many fledglings actually survived. Till the nod from the Wildlife Board is received for the creation of conservation reserves, the department plans to increase the number of nesting sites in the adjoining areas. At present the vulture sites are mainly concentrated in Parol, Salol, Chadevh, Daulatpur and Mastgarh as these areas have ample mother pine (chir) trees which the vultures find the most suitable for their nests. Attempts are being made everywhere to save nature’s scavengers from certain extinction through captive breeding programmes. Later, it was due to the pressure on the hospital authorities that Raksha delivered a baby in the hospital today. Raksha, a resident of Kehan Chari, Baggi, was admitted to the hospital on December 19 as a pregnancy case. After she developed labour pain, she was taken to the labour room at 4pm yesterday. But the doctor, when she did not deliver as expected, asked her husband Bali Ram to take her to Shimla as she might have complications as there was no gynaecologist in the hospital at 2 am today. “We contacted private hospitals, but all refused saying that they did not have gynaecologists,” rued Bali Ram and Des Raj, a social worker who was rushed to the hospital for help. But it was pressure from the media and politicians that Raksha was attended to and delivered a baby at 9.45 am today, they added. Plight of pregnant mothers, who develop complications, is no better in Zonal Hospital, Kullu, as well. A couple from a remote village in Kullu was referred to Mandi from the Kullu hospital, and from Mandi they were referred to Shimla as there is just one gynaecologist for Kullu and Mandi district and the doctor have to attend the family planning camps also. Medical superintendent, zonal hospital, Dr CR Verma said they faced problem initially as communication with the patient was tough and she was being referred to Shimla as they suspected some complications as gynaecologist was not there. But the delivery was normal and mother and child were in good health, he claimed. Health officials claimed that the state was facing a shortage of gynaecologists. An FIR has been registered in this regard today against Jeet Ram and Sohan Lal, who were dealing customers at the cash counter of the department. Baddi SP Gurdev Chand Sharma said an FIR had been registered and further investigations were being conducted to ascertain the facts. Executive engineer AS Dhillon, while confirming the news, said he had placed Sohan Lal, who was a regular employee under suspension, while the Jeet Ram’s case, who was a daily wager, had been sent to the department’s secretary for further action. Though the duo had been accepting cash payments from domestic and commercial consumers for their power bills at the cash counter, the cash was not being credited into the department’s account. Unsuspecting customers were also being issued receipts in lieu of depositing the bills. Dhillon said he started suspecting something fishy as scores of cases came to the fore where bills had remained unpaid in the official accounts yet their electricity connections had not been disconnected for months. The embezzlement came to the fore when officials disconnected almost 250 to 275 connections for non-payment of bills and consumers returned with receipts showing payments they had made. Sohan Lal, however, tried to save his skin by offering Rs 1 lakh to some customers who had visited his office yesterday and he offered to repay the money today to others also. Suspecting the scam to be in several lakhs as the bills had remained unpaid since September, Dhillon said an FIR has been registered against the duo today at Baddi. He said the embezzled amount could be in several lakhs as each customer had paid thousands per month as bills. Lit with colourful lights, the courtyard of the Masrur temple was buzzing with recital of sitar from Azeem Ahmed Alvi, flute from Rishab Parsana and Tabla by Hafeez Ahmed. The Kathak performance by Shelja from the Lucknow Gharana and Shakshi Kumar from the Jaipur Gharana held the audience spellbound for about two hours. The coronation of Shiva that is the theme of the Masrur temples was presented through a stage performance by students from Shimla. The programme was presided over by Chief Minister PK Dhumal. He congratulated the Tourism Department for its efforts to promote this remote area. He announced on the spot that the Masrur Festival would be held for two days every year for promotion of tourism. Dhumal said a request had been made to the ASIs to provide special attention on maintenance of monuments under their control and also urged to authorise the state government to take up the repair works of these monuments. The Masrur temples are one of the four monolithic rock-cut temples in the country. Two of these, including Kailash of Elora and Mamalapuram in Deccan, are famous across the world. The third is Dhamnar, located in Rajasthan, and the fourth are the Masrur temples located in Kangra district. While the other three temples are in a pit or on the ground, Masrur is unique due to the fact that is located on the hill top at a height of about 2,500 feet from the sea level. Though there is no definite theory regarding the origin of Masrur temples, NK Singh, former chairman of the Airports Authority of India, who has authored a book on the subject, claimed that the temples were most likely built by a Hindu emperor. In his book on Masrur temples, Singh has claimed that Hindu emperors from Afghanistan after attacks from foreign rulers kept their treasure in the Kangra fort. Since they accumulated their treasures in the areas, most probably they had constructed the temple, located 25 km from Kangra. He claimed that probably a Hindu ruler, Jayapal, got the temples constructed hiring the services of craftsmen from the Central Asia. Singh has also written a book titled “Coronation of Shiva Rediscovering Masrur temples”. He offered the book to the Himachal Government for promoting temples from the tourist point of view. Singh, has opined that the temples were built between the 6th and 8th Century AD. He has based his opinion on the fact that before this period, there was no evidence of rock-cut temples in the country. Most of the rock-cut temples in the country were build during this period. After the 8th Century, there was chaos in the region and the rulers did not have resources or time to take up such a huge project. He, however, said the issue was still open for research by historians and archaeologists.